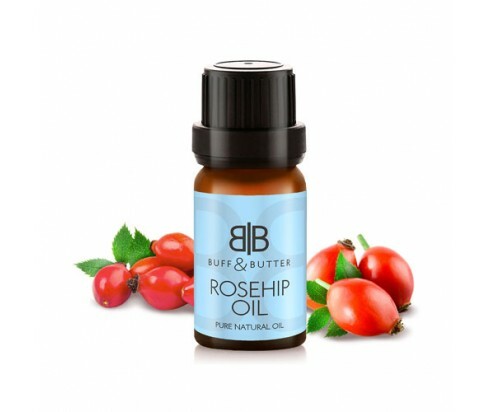 Rosehip Oil is ideal for anyone looking to moisturize the skin and keep it hydrated without a greasy residue left behind. This “dry” oil penetrates the skin for maximum effect, leaving skin hydrated and protected against the elements that can often dry skin. It is rich in fatty acids (oleic, palmitic, linoleic, and linolenic), which not only moisturizes, but also has a healing effect that is ideal for keeping skin feeling soft and looking youthful. Rosehip Oil is also effective in relieving skin irritation and is gentle enough to use undiluted on skin. You can also add it to lotions, creams, and serums or use it as a base for massage oil. It also blends well with essential oils, allowing you to enhance their benefits. If you want a natural alternative to expensive skin and hair care, rosehip oil is well worth a try. It helps reduce skin blemishes, hydrates the skin and relieves skin irritation. It can even be used as a hair conditioner. Rosehip oil has been a preferred natural skin oil for a long time. It was reputedly used in Mayan culture, 4,000 years ago, as a skin treatment. It has recently come on trend after people learned of its wide use in the beauty industry with models like Miranda Kerr extolling its virtues. It’s also reportedly used by well known personalities such as Gwyneth Paltrow, Victoria Beckham and the Duchess of Cambridge. Men are also finding the benefits of rosehip oil. David Gandy, the British model, says that rosehip oil is his favourite thing for moisture, after trying it in Australia, and finding that it did wonders for his skin. In addition there is a scientific basis for these claims! Research, mostly in Spain and South America, has shown a significant reduction in stretch marks, reddening and discoloration of the skin and scarring after the application of rosehip oil. Rosehip oil is a carrier oil, meaning that it is used to dilute essential oils which, if left undiluted, would cause irritation to the skin. Rosehip oil is made by pressing the seeds of the wild rose (Rosa canina, also Rosa rubiginosa and Rosa moschata). The seeds are found in the fruits of the rose which are called hips - the swollen pods left after the rose petals fall. The seeds are cold pressed which means that the cells, which contain the nutrients and enzymes, are removed from the fibre by pressure, without the use of heat which would reduce the quality and freshness of the product. Skin blemishes can take various forms such as scars, uneven colouration and reddening of the skin. These blemishes are often considerably relieved by the fatty acids in rosehip oil. The fatty acids found in rosehip oil are an ingredient of most moisturisers. Rosehip oil has a high percentage of omega-3 (linolenic acid) and omega-6 (linoleic acid). These acids help to repair damaged skin by regenerating the skin cells, resulting in a smoother and more uniform complexion. They help to smooth out marks on the skin such as stretch marks and scars, and also help to hydrate the skin giving it more elasticity. Rosehip oil contains a topical trans-retinoic acid which is a result of the conversion of vitamin A (retinol). Retinoids are widely considered to be the only proven treatment for the wrinkles and lines resulting from ageing. They act on skin pigmentation, providing a good skin tone, and alleviate rosacea and acne. They also reduce the level of enzymes which cause the breakdown of collagen and elastin due to the effect of the sun, resulting in younger looking skin. Rosehip oil contains the antioxidants lycopene and beta-carotene. Various beauty products incorporate lycopene into their formulae because it helps to protect against UV rays and boosts the health of the skin. It soothes sunburn, although it doesn’t act as a sunscreen, and normal precautions against sunburn should be taken. Lycopene combats free radicals. Free radicals are the waste product molecules that are built up in a cell due to natural chemical processes, and an accumulation of them harms the body’s cells, and may be linked to ageing. Beta-carotene is an antioxidant that also helps prevent free-radical damage. The lycopene and the high levels of beta-carotene present in rosehip oil help to protect and repair tissue. The oil can be applied directly to the skin as it is a mild carrier oil, but should be tested on a small patch of your skin first to ensure that you don’t have any allergic reaction. It is a dry oil which means that it is absorbed easily without leaving a greasy appearance on the skin after applying it. To make use of its hydrating qualities try adding one or two drops to your moisturiser. For hair and nails - heat some rosehip oil and massage it into your scalp, then leave for an hour and rise out and your hair will feel soft and look shiny. Similarly rosehip oil applied to your nails will make them look less brittle and hydrate them. If you intend to use the oil for stretch marks consult your doctor beforehand if you are pregnant or breastfeeding.